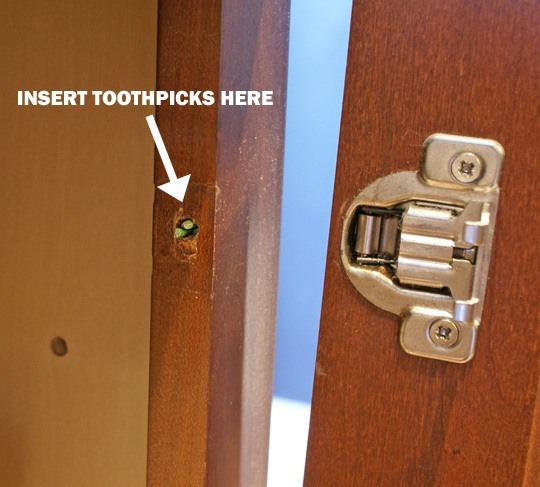 "Taking my father's advice, I unscrewed the hinge and placed a few pieces of toothpick in the screw hole. As I reinstalled the screw, I could feel that the toothpick pieces were doing their job. Basically the screw is able to grip onto the soft wood of the toothpick pieces, which creates a tight fit that couldn't be achieved in the stretched and stripped hole." There you go. Remove screw. Line the hole with toothpicks. Re-insert screw. Done. 35 Life Hacks! Free Perks, Snarky Tricks and More. Life Hack: 10 Foods You Can Make in a Coffee Maker. HowTo: Cure Burnt Fingers With Your Earlobes & More Life Hacks. HowTo: Quick & Easy Beer Storage Hack. Home Hack: Silence a Leaky Faucet With a String. Quick and Clever Drill Hacks. Very cool!! Love it! I am so glad I saw this, CAN'T BELIEVE I DIDN"T THINK OF IT!!! I was trying to think of a simple solution to this the other day. used wood putty, not as good. I almost want to wreck a perfectly snug hole just to try this. lol! might just do that as well Steve!! hahah! That's not a stripped screw, it's a stripped hole. It's also common sense.